Our Real Love Girls' 3-Pack Crew Neck Tee Shirts are sure to please your daughter, niece, sister, girlfriend, or friend. With such great color options to choose from, it's hard to choose just one pack. However, economical prices make it easy to purchase more than one! Offered in many colors, you're sure to find something that pleases the eye. 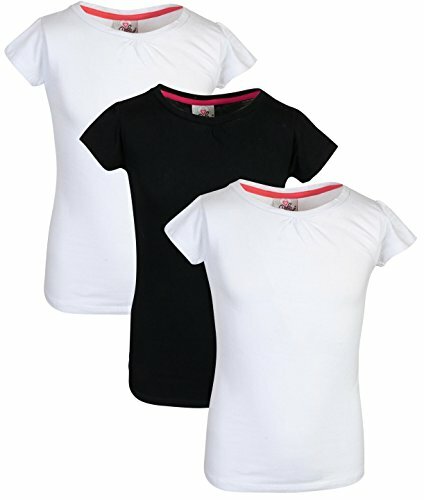 These crew neck shirts for girls offer a great solution to casual wear, summertime as well as during the school year. The straight hem ensures a level length around the waistline of the cotton shirt creating a classic look. Short cap sleeves allow her to show off her arms and prove that cute look she wants. Real Love only uses high quality materials; these crew neck shirts are made from 95% Cotton and 5% Spandex so they're nice and soft but they're also a bit stretchy. Craftsmanship and quality are very important to us, which is why our shirts will always be held to the highest standards. They're durable and will last long after your little girl outgrows them, perfect "hand me down" for younger sisters. She will be begging for a larger size when she outgrows her favorite new crew necks, and we're confident you'll be back to buy again! Real Love apparel makes a great and inexpensive birthday gift or Christmas gift. Check out our store front, we have plenty of other great products available for all the girls in your life! These shirts are slim fitting. If you are unsure of size, consider ordering one size up. If you have any questions about this product by Real Love, contact us by completing and submitting the form below. If you are looking for a specif part number, please include it with your message.